1992 Chevrolet Silverado 1500 - Awesome, reliable and envied by other truck owners! I like the truck because it has a nice lift kit and pre-runner look to it. Unfortunately with the lift kit and larger tires comes an increased gas bill. I enjoy driving my truck so I can sacrifice the extra money in gas. I would like to install a new light bar on the truck. I have in mind a 50 inch LED light bar over the windshield that would make it bright as day. Coupled with the KNN air filter, the exhaust system makes for a nice throaty growl. Cruising along the freeway, the tires make a lot of noise since they are mud terrain tires. It is good for off roading, but not so good for the freeway. I recently tinted the windows which helps in the hot summer since my air conditioning system does not work properly. It needs a new air conditioning compressor. I intend to replace this in the somewhat near future. For a 1992 with 184,000 miles, this truck runs very well. Although it does give some slight mechanical issues from time to time, there have been no major issues to speak of since purchasing the vehicle over a year ago. Hopefully it stays that way! Overall the exterior is in very good condition with the exception of the roof paint chipping. This is another project I intend to take on in the somewhat near future. My family and I took the truck off-roading in the desert and used the bed of the truck as our sleeping location. I purchased this truck primarily due to the fact that it was a 1990's box style Chevrolet pickup. It also came equipped from the previous owner with a lift kit, larger tires, front and rear bumpers and off-road lights. I like that the lift kit is not too big so that I do not have to jump in or out of the truck and neither does anyone in my family, including the dog. Since the lift kit is not too big, that also means I do not have to buy tires that are extremely large and expensive. I also purchased this truck because it was a 1992 with under 180,000 miles. It was also in very good mechanical and aesthetic condition. The interior of the truck, with the exception of the dash, was in very good condition. All electrical components were working, including the electric windows which is rare for that model year. I have personalized the truck with stickers and my own flair making for a one of a kind beast of a truck that any truck lover would be proud to cruise around in. The bumper that came with the truck, front and rear, were pre-runner style bumpers which are a popular style where I live. Overall, this has been my favorite truck that I have ever owned and I have owned quite a few in my lifetime, old and new. My main concern when purchasing this truck was it's age. Being such an old truck there are numerous things that can go wrong with it. Although the transmission and head gasket had recently been replaced, two major problems of this vehicle, there were a myriad of other issues that could go wrong with this truck. That being said, the gentleman that I purchased the car from seemed to have taken good care of the truck and I was fairly confident that there would be no major issues in the near future. My next concern was that the vehicle would not pass smog, and it did not at first. After a few trips to the mechanic, we were able to identify the problem but it was still a hassle and still cost money. The locks on the doors did not work and required two different locksmiths to fix. When fixing, this required taking the whole door apart on each side due to how old this truck was. The driver side door does have trouble closing and at times can take multiple tries to shut. The paint on the roof is chipping along with the bed of the truck. I have since painted the bed of the truck but the roof is still on my to do list. The air conditioning does not work which isn't a problem during the cooler months but during the summer time it can feel like a sauna inside. The 5.3L V8 delivered a respectable 15mpg. It seats 5 with ample leg room for all. The bed of the truck provides corner tie downs sufficient for bundling the largest of loads. *Nugget* Being one of the most common trucks on the road today, it is easy to find parts in stock at dedicated automotive stores and even basic maintenance items that fit correctly at generic big box stores. With the tall 17" wheels, ground clearance is significant allowing easier maneuverability through the thick stuff. The driver's side window motor went out which makes going through a drive through a little difficult. Not to be deterred our family of 5 could be seen going in reverse through a fast-food drive through so that we could pay and get our food through the passenger window. The basic model without bells and whistles provides peace of mind over worry of one of the "expensive" frills going awry. The rear view mirror provides a built in compass for easier "male" navigation. The engine compartment still provides room for diy'ers to maneuver and wrangle replacement parts in and out without being a yoga master. The ground clearance is significant allowing me to change the oil and remove the spare tire without needing to ramp or jack the truck. The cloth seats have gone through plenty of "children interactions" but are easy to clean and hides the evidence well. The brilliant GM security feature of Passlock would be very welcome if someone was trying to steal the vehicle; however as the owner it is very troublesome when the Passlock malfunctions and believes that I am a thief (repeatedly) - delaying my starting of the truck for 15-20 minutes at a time and stranding me for the wait time. Disabling this nice feature is next to impossible, bypassing it might be a hacks dream, and no recall make this very frustrating. The seats are standard flat benches, not providing much contour or adjustment features for customizing or improving comfort. 17" Tires are not cheap so when it is time to replace a set, a home equity loan might be in order. The paint blisters sooner on this vehicle than the Hondas or Toyotas that I've owned; and I've seen the same blister patterns (roof/hood) on others' same model also. 2006 Chevrolet Silverado 1500 - It is like a family member. The truck is great for families and single people as well. It does great with hauling and moving items. The bed space is just enough room for taking my 4-wheeler to the mountains without needing to take our trailer. The truck is 4-wheel drive and does amazing during the winter in the city, as well as, in the mountains. The truck has never gotten stuck in any weather condition. The inside is a little small in the back but can fit at three adults comfortably. It has cloth seats and the stereo can be controlled through the steering wheel. The seat in the back can be folded up to put extra large items into the inside of the truck if it raining. The front doors must be opened first before the back doors can be opened. The maintenance on the truck has been minimal and very inexpensive. The truck can be used for someone in construction or as a family vehicle. The payment on the vehicle I think was a little high, but then again it is a 4-wheel drive truck. The trucks performance both around town and going into the mountains is impressive to say the least. You feel safe when riding in the vehicle. We took the truck to go 4-wheeling with friends. We discovered many new areas within the Utah mountains and stopped for lunch far back in the mountains where a car cannot go. It has 4-wheel drive and does not get stuck. It has great performance and is suitable for a family. It can haul a lot of things with ease. The cloth seats make it easy to clean the interior of the vehicle. Having the radio controls on the steering wheel makes it easy to keep your eyes on the road and not taken your attention from the road. The traction control of the vehicle is great as it really grips the road especially in 4-wheel drive. The controls to change from 4-wheel to 2 wheel are located on the dash board. This makes it easier do that you do not have to get out of the vehicle to switch it over. This is great for bad weather as it can be switched over very easily. That it does not have a sun roof. I do not like how the front doors have to be opened first to get the back doors open. The back windows are a pop out and do go down. This makes it difficult to get a lot of air into the back without having the front windows open. Chevrolet unveiled the fourth-generation Chevy Silverado 1500 in mid-December 2017. The redesigned model, which will be available in showrooms from the fall of 2018, features a more sculpted exterior that spots curvy edges, swoopy lines, and headlights that arc inward and integrate into the front grille. The body and frame are made from a mixture of aluminum and steel that makes the fourth generation as much as 450 pounds lighter than previous-generation models. Fourth generation models also feature a fresh interior with a centered rather than offset steering wheel. Crew-cab models have been stretched to give rear passengers 3 inches of more leg room, and internal storage has also been enhanced with 24-liter and 10-liter bins under the rear seats and in the rear seatbacks respectively. Buyers can choose from among eight trim levels including a High Country trim with 20-inch aluminum wheels. In addition to the 5.3- and 6.2-liter V8 engines, Chevrolet added a turbo-diesel 3.0-liter, six-cylinder engine to the powertrain options of the new generation. The diesel engine, like the 6.2-liter V8 engine, is paired with a new 10-speed automatic transmission. With powertrains refined for real-world driving, the Chevy Silverado can tow up to 12,500 pounds. Compared to previous generations, the third-generation Chevy Silverado 1500 stood out in that it was quieter, smoother, and more power-efficient than previous generations. The new models featured a revised steering system that included electric assist for simplified tuning and refined suspensions that increased handling responsiveness. Third generation models also benefited from increased power output. The capacity of the base 4.3-liter V6 engine, for example, was increased from 195 to 285 horsepower. In addition to the V6 engines, Chevrolet also gave buyers the option of a more powerful 420-hp, 6.2-liter V8 engine. All engines across the powertrain had new technology, including direct injection and cylinder deactivation, which increased fuel economy. Four-wheel drive was available across all generational models. A six-speed transmission, which became the standard in the new models, replaced the four-speed unit in some of the previous models. Chevrolet made just a few changes to the exterior and interior look of the third-generation model. New trucks had full-width bumpers and sculpted fenders, and the interior got plusher seating and a new octagonal center stack. The stacked headlight design was discontinued in a 2016 refresh, and the Silverado got a new front fascia and grille. For this generation, the body construction used more aluminum and high-strength steel to lower the trucks’ total weight. 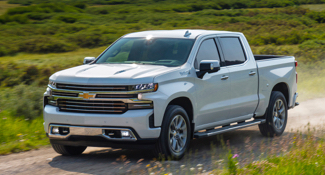 Chevrolet redesigned the second-generation Silverado 1500 to feature a new front frame design, rack-and-pinion steering, and improved fuel economy. Unlike the first generation, which was only available in three trim levels, the second generation had five trims, including the base WT trim and the higher-level LS version. The LS trim added full-power accessories, cruise control, and keyless entry. The crew cab had the option of an extra fuel economy trim. In addition to the 4.3-, 4.8- and 5.3-liter V6 Vortec engines that powered the previous generation, Chevrolet added the new and more powerful 367-hp, 6.0-liter Vortec 6000 V8 engine and the 403-hp, 6.2-liter Vortec 6200 V8 engine. All V8-powered trim levels got a new six-speed automatic transmission, FlexFuel technology, and electronic stability control. Buyers could choose between two- and four-wheel drive on almost all models. Some of the new safety features that came with the second generation included four-wheel anti-lock disk brakes, adjustable pedals and navigation, and side curtain airbags. The Chevy Silverado 1500 was first released in 1998 as a 1999 model. The light-duty pickup truck was based on the GMT 800 platform—which General Motors used in suburban and other full-size SUVs—and was designed as a larger and more aerodynamic replacement for the C/K truck. The first generation had a classic body style that came in three cab styles: regular cab with two doors, extended cab with four doors, and crew cab with four front-hinged doors. Buyers could choose from among three cargo beds: a 69.2-inch short box that only came with the crew cab, a 78.7-inch standard box, and a 97.6-inch long box. These models had a towing capacity of half a ton, three-quarters of a ton, and one ton. The heavy-duty Silverado 1500HD had a towing capacity of 10,300 pounds and could haul 3,129 pounds in its bed. The power options available in the first generation were a 195-hp 4.3-liter V6, a 255-hp 4.8-liter V8 and a 270-hp 5.3-liter V8 engine. Chevrolet introduced several variants of the Silverado 1500 during its first generation, including a 2003 high-performance SS model that came with a 345-hp, 6.0-liter V8 engine and a heavy-duty series that ran between 2000 and 2007. The Silverado 1500 was the first pickup truck with an automatic transmission with a tow/haul mode.